You'll notice my nails are getting in on the pastel act too! They're painted with Sally Hansen's I Lilac You. 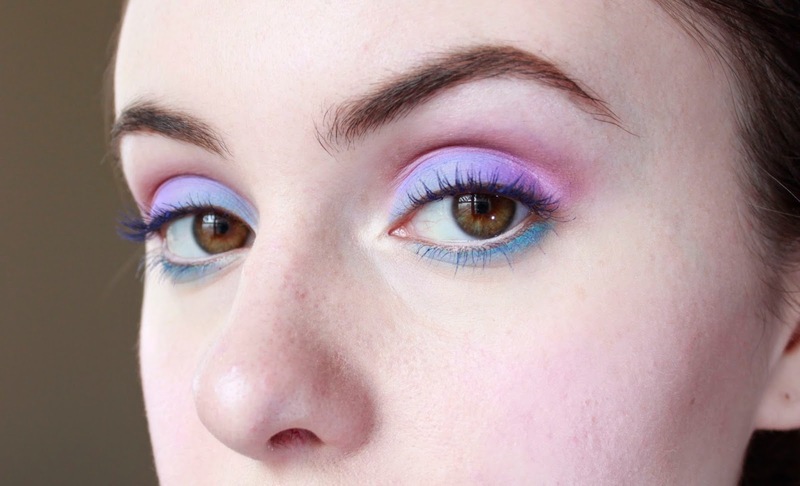 Obviously, pastels can start to look pretty dated if you pile on peach after mint after lavender in your makeup, nails and clothes, but I hope you can take a few elements of this look and have fun with them! I've already applied foundation & concealer here, and added a bit of pencil to my brows (eyebrow how-to coming up later this week!). Now I'm taking my brand-spanking-new MAC Casual Color which is for cheeks & lips. Look at that color! They're limited edition and also come in a brighter pink & coral. Cream blushers are great for spring & summer because they provide a dewy glow, while powders can look chalky in lots of sun & heat. 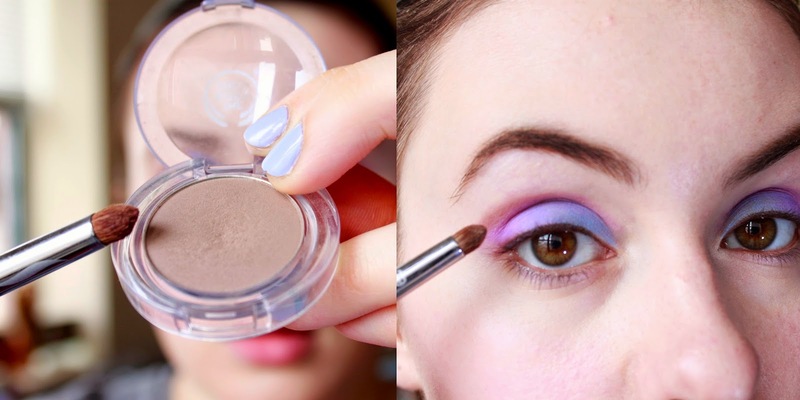 Plus, they're easier to apply than powders; just tap on with fingers. Now I've done a bit of contouring & highlighting; click here for a more in-depth step-by-step on that. Here's that tightlining step I mentioned using the Maybelline brown gel liner. 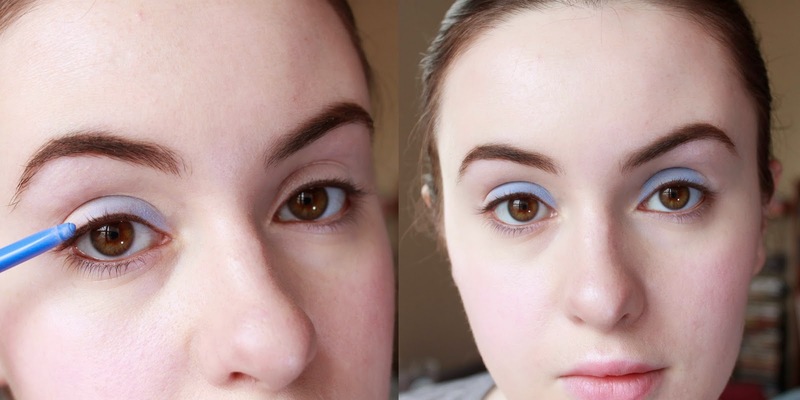 Tightlining can be uncomfortable when you first try it, but once you get used to it, it makes a huge difference in the intensity of your eye makeup. Tightlining involves placing eyeliner on your waterline, which is the space between your eyeball and your upper or lower lashline. It's the quickest way to make your lashes appear fuller without mascara, because it makes it seem that your eyelashes start a few milimeters before they actually do. Along with this, I've pushed a bit of the gel liner into my lashes from the top side. You can see in the right image, where I've tightlined on the left eye only, what a difference it makes. For today, I want subtle definition yet a sense of openness, so I'm using brown liner on top and will be placing some white liner on my lower waterline later. 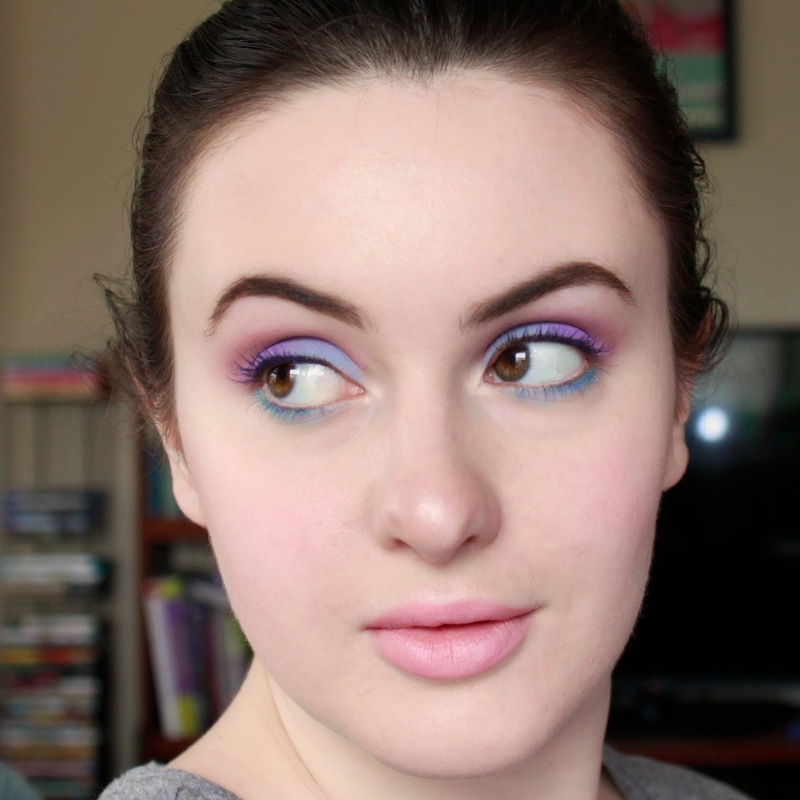 For more dramatic looks, you could use black liner on both the upper and lower waterlines, or you can use color, like I did with purple on my lower waterline in this post. But those are options for another look! Lavender! Don't ask me why this is considered a blush by Makeup Forever; I'm just happy that this color exists! I'm using a medium-sized domed brush just to get a lot of color on the lid, and then using this smaller, pointed brush to define the shape of the shadow into my crease. By the way, you can see in these images that the brown liner is transfering a bit from my upper to lower waterline. Frankly, I'm still searching for the solution to this! It happens almost every time I do this, even with waterproof liners. Someday I hope to find the answer, but for now just wipe it off the lower waterline when it happens. Now, time for more of that definition with this light taupe shade from Body Shop. I'm applying a bit into my crease in a windshield-wiper motion. 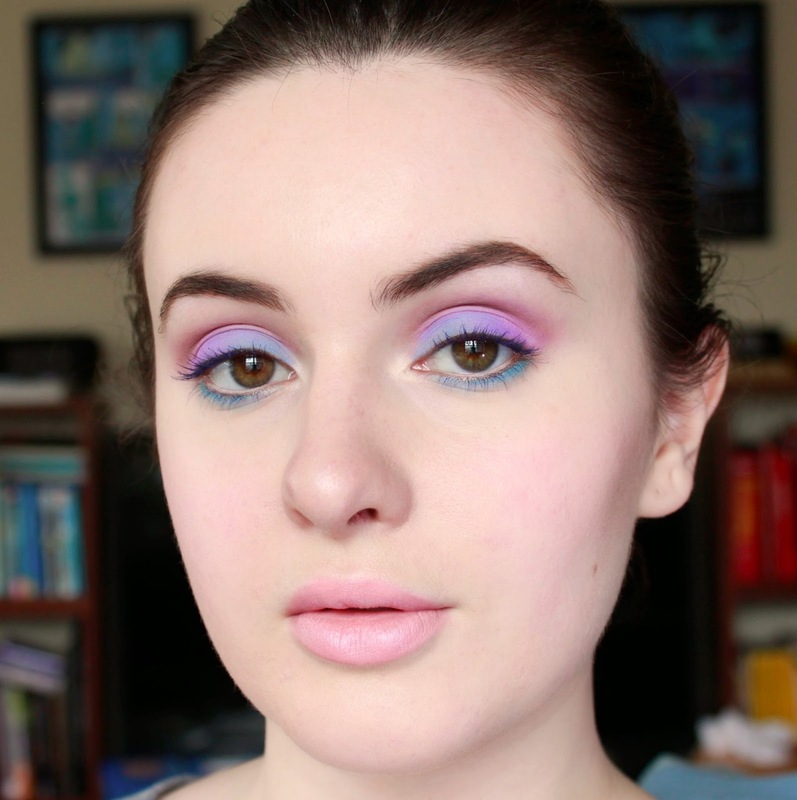 I believe that incorporating a neutral is so important when applying a bright eye makeup look. Without some version of brown, gray or black to ground the look, bright shadows look unfinished & disconnected from your face, like a set of outlets without a wall plate. Now, I'm applying Stila's liner in Turquoise onto my lower lashline, blending out with my fingers. 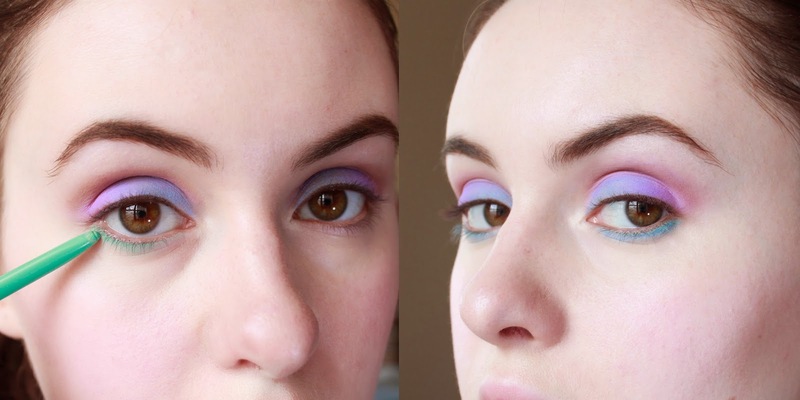 I then decided that this shade was too jarring a difference from the lavender & periwinkle, so I layered a bit of the white liner and then the periwinkle on top to make it more of a robin's egg color, with just a hint of turquoise to it. Threw on a couple coats of navy mascara on top & lower lashes after deciding that black was too harsh for this look, and that's it for eyes! Now for lips! 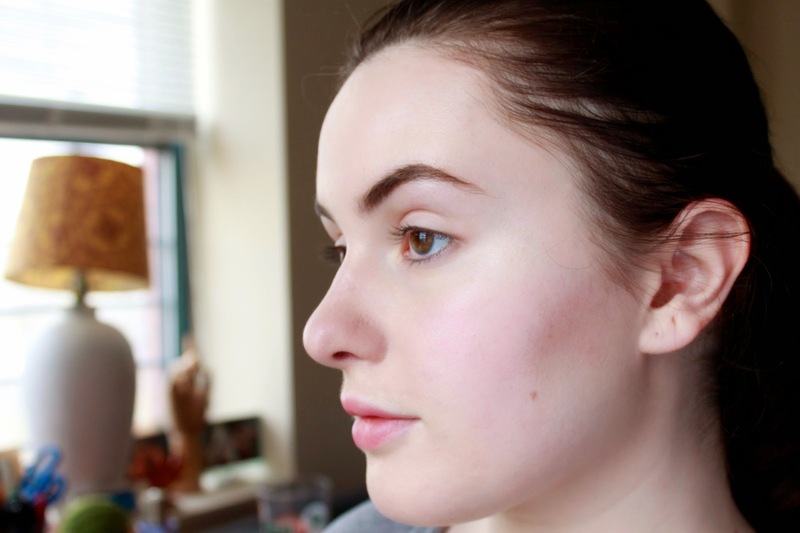 Here's that outline of NARS Dolce Vita followed by the sam MAC cream I used on my cheeks applied with my fingers. As you can see, it's a real baby pink that is basically the same value as my skin with a more pink hue, so having that darker shade underneath helps it from completely disappearing onto my face. And that's all folks! I hope you'll consider trying some refreshing spring colors now that the weather's getting warmer. Have fun with it! P.S. — Full disclosure guys: for after finishing this makeup, I tried out the "bow bun" trend thinking it'd be a cute addition to the look; it came out alright, it was just too cute with all these pastels. But I do think it'd be a fun look to try with really intense, edgy cat-eyes & leather jacket as a girly contrast. But that's another post!